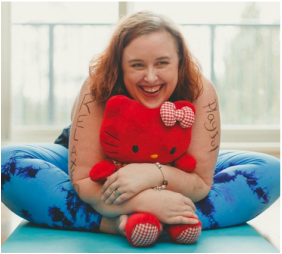 Hi, I'm Lisa, The Fat Yogini and I'm writing a book about self-worth! ​Want to stay in the loop? Sign up for updates, below! I was the girl who hid in the back of the classroom. The one who stood in the back at dances. The one who wanted to fit in, to be popular, to be crushed on, to be liked. I was the girl who preferred books to people - because books were nicer. I was the girl from the dysfunctional family who felt out of place and alone. I was the girl who was bullied. The one who told the teachers that the bully was "just teasing" and laughed it off because to tell was to be bullied even worse. I was the girl that was afraid. Afraid to be seen. Afraid to stand out. I was the girl who was afraid to say no. I was the girl who wanted to feel pretty. I was the girl who couldn't be bothered to get into any of the things the other girls were into. I was the girl who could care less about fashion or makeup or making an effort about my appearance because it wouldn't make a difference anyway. I was the girl who felt unworthy. Who felt like she would never belong. I was the girl who became a woman who gave and gave, and got hurt over and over. I was the woman who put up with poor treatment from friends and partners and lovers because it was "the best I could do". I was the woman who thought any love was better than no love, even if it came at a price. I was the woman who dreamed of white picket fences and pretty white dresses and fairytale happy endings but who believed it would never actually be possible. But then, all of that began to change. People talk about transformation so casually. It's become one of those words that means something and nothing all at the same time because it's over-used and rarely explained in a way that makes sense. My transformation began with Yoga. It began with the discovery that my body might not be my enemy. It began with the idea that I could start paying attention to how I felt physically, but also to how I felt emotionally, to my thoughts, to my needs and wants and desires. Transformation doesn't just happen. It explodes. It burns away everything you ever thought you knew about yourself and the world and replaces it with something new - and that newness isn't always easy. You have to work for it. And it's hard. Often it's three steps forward, two steps back or even two steps forward and three steps back. But no matter how hard it gets, no matter how much work it requires... it is so, so worth it. After I discovered my body may not be the enemy, I discovered a world that included concepts like Health At Every Size (HAES) and Body Positivity. This idea that I could accept my physical body as okay exactly as it is, and focus on health and mindfulness and joyful movement was new and fascinating and, quite frankly, a breath of fresh air. Sometimes, you don't know you're holding your breath, until you finally exhale. Discovering body acceptance, self acceptance, and self-love was like that for me. It was an exhale after decades of holding my breath. The truth is that, all those years, I'd been waiting for someone else to give me permission to love myself, to believe in myself... ...when, all along, the only person whose permission I ever needed was my own. Join me on the journey... to your Self.